"These are my 5 primary throwers. The first knife (on the left) is the first real throwing knife I ever bought. It is an OLSON'K, and it was made in Howard City, MI." 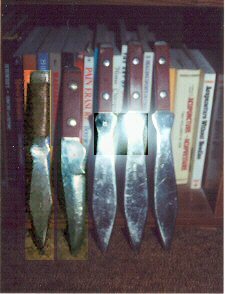 "After I decided that I wanted more "real" throwing knives, I contacted Mr. Harry McEvoy. (I read his book on throwing). Anyway, I then purchased 3 of the TRU-BALANCE SEMI PRO KNIVES on the right. These have really been good knives for me." "Shortly there after I was looking for a "hunting knife". One that was heavy duty. That's when I got the TRU-BALANCE COMBAT KNIFE (second from the left). She has been a good blade for me too. I carry this one when I'm hiking etc." "I got all of these knives in the early 70's!" "On the left, a Japanese knife I got back in the 60's while in the Army. It's 7 1/2" long, with a heavy spine for its size. 1/8". The pommel had wings like the hilt, but I ground them off." 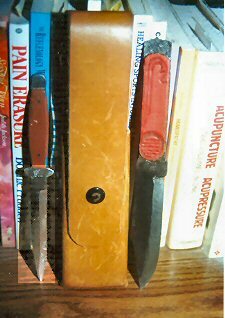 "On the right, is an old hunting knife. Its almost 9" long. It came with a black plastic handle and finger guard. And only cost $1.50! Anyway, it was badly rusted, the handle was broken and the guard was gone." "I took the handle off, steel wired the blade and glued some leather on for handles. It throws nice at close range."